Bungee jumping and skydiving are two adventurous activities that can be very exciting and enjoyable. In both cases, an adrenalin rush is produced by jumping from a great height in order to enjoy falling towards the earth with speed, but the experience of bungee jumping is actually very different from the experience of skydiving as you shall see. Bungee jumping makes use of an elastic cord, which is attached to the jumper using a harness. As you jump, the cord stretches. When it reaches its maximum length, it will rebound, pulling you up again. It will stretch and rebound several times until coming to a stop. The length of the bungee cord needs to be carefully chosen for the height of the jump and the weight of the jumper, in order to ensure that the cord will stop their fall before they reach the bottom/ground. You can bungee jump from many different places, such as buildings, bridges or the top of a crane. It is also possible to jump from a helicopter or a hot air balloon as long as it is hovering rather than moving. Skydiving requires an airplane from which to jump and a parachute. When you are skydiving, you will free fall during the first part of the jump, but then you will open your parachute in order to slow your descent to the earth’s surface. Anyone can go bungee jumping without needing to undergo any training since it is up to the operator of the equipment to ensure that they will be safe. Training is required in order to go skydiving, however, since the jumper needs to know how and when to open their parachute and how to ensure that they land safely. However, it is possible to go skydiving with very little instruction since you can be strapped to an experienced instructor who will control the parachute while your enjoy the ride. 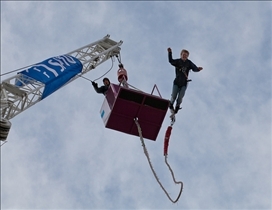 People enjoy bungee jumping both for the experience of the initial free fall and for the rebound. It is a fast and exciting experience. Bungee jumping involves jumping from a high position while connected to an elastic bungee cord. The jumper falls quickly through the air and is pulled back by the bungee cord, usually springing up and down several times before coming to a rest. Skydiving involves jumping from an aircraft at a much greater height than a bungee jumper. The jumper initially falls through the air quickly, but once the parachute is opened, the rate at which they are falling will be slowed down. The parachute will slow the descent enough to ensure that when the ground is reached, the skydiver can land unharmed, although there can still be a fairly strong impact. Skydiving tends to last longer than bungee jumping, and it also provides an opportunity to see more of your surroundings. For this reason, people often choose to go skydiving in landscapes that are particularly beautiful, in order to enjoy the view. Skydivers usually jump from about 4000 feet, free falling for about a minute before opening their parachute and continuing to descend for another five to seven minutes. During the initial free fall, a skydiver can enjoy a similar rush to a bungee jumper, but once the parachute is opened, they will have a very different experience. The skydiver's fall is slowed and they are gently returned to earth, while the bungee jumper will bounce several times before coming to a stop at the end of the bungee cord, hanging above the ground. 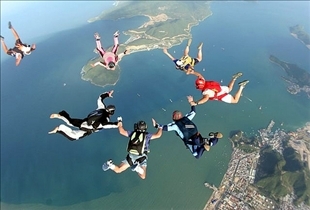 It is possible to jump in tandem, strapped to another person, either when bungee jumping or when skydiving. Many people have enjoyed both bungee jumping and skydiving safely. The equipment used in these activities is usually carefully checked and the safety precautions are taken in order to prevent problems. However, both activities are inherently dangerous, so there have been injuries and fatalities associated with both bungee jumping and skydiving. Miscalculations about the length of the bungee cord, misjudgment of when the parachute needs to be released, and equipment failures can all cause problems. Bad weather can also be dangerous, particularly for skydivers. Bungee jumping and skydiving can both be exciting, but dangerous activities, but the experience of a bungee jump is very different to that of skydiving. Bungee jumping is faster and takes place over smaller distances than skydiving. The dangers of bungee jumping and skydiving are also very different, but both are risky activities. Bungee jumping is all about the free fall, while skydiving gives you a chance to admire the view at a slower pace after your free fall. Skydiving brings you right down to the ground, while bungee jumping leaves you hanging. You need to undergo training in order to skydive alone, but anyone can perform a solo bungee jump.